5' x 5' (25 sq. ft.) – will hold a chest of drawers, a small mattress set, boxes and small items. Useful for garden tools, or seasonal decorative items. 5' x 10' (50 sq. ft.) – will hold furnishings of a mid-size bedroom, including a queen-size bed, dresser, TV, and a few storage boxes. 10' x 10' (100 sq. ft.) – will hold the contents of an entire family room or two full bedrooms. 10' x 15' (150 sq. ft.) – will hold the contents of up to three bedrooms in this unit. Recommended for larger items such as pianos, couches, tables, or large-screen TVs. 10' x 20' (200 sq. ft.) – will hold the contents of a five-bedroom house, including a refrigerator, washer/dryer, dining room table, chairs and large boxes. 10' x 25' (250 sq. ft.) – will hold the contents of a 5 to 7 bedroom house, including large items such as a couch, bed, fridge, and entertainment center. 5' x 5' (25 sq. 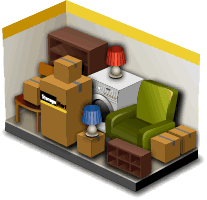 ft.) – will hold the contents of a large office closet filled with files, books, office chairs, and a few storage boxes. 5' x 10' (50 sq. 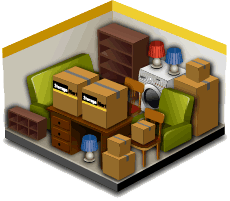 ft.) – will hold the contents of one office room, including desks, bookcases, filing cabinets and large storage boxes. Ideal for storing equipment and tools. 10' x 10' (100 sq. ft.) – will hold the contents of an entire office, including desks, chairs, computers and a few storage boxes. 10' x 15' (150 sq. ft.) – will hold the contents of three office rooms, including several desks, computers and boxes. 10' x 20' (200 sq. ft.) – will hold the contents of five office rooms (desks, computers, bookcases and file cabinets) or a five-year supply of business and tax files. 10' x 25' (250 sq. 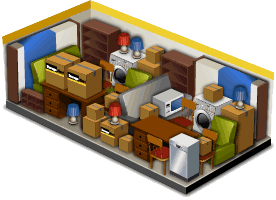 ft.) – will hold the contents of five office rooms – many desks, several large boxes, seasonal storage, a few sets of large storage shelves and/or a few pallets of inventory, depending on how high you stack and/or organize. 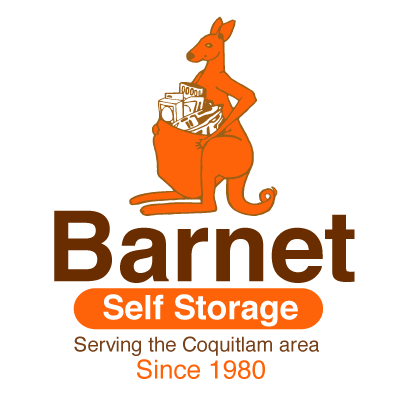 Your Barnet Self Storage representative can answer any questions you may have and give you suggestions on how best to store your items to maximize space.